Technology Partnerships Canada was a critical element in the development of SemBioSys. It allowed us to transform our technology from scientific principle to a commercially viable technology platform. It also triggered significant private investments that have allowed us to develop our product pipeline. President and CEO of SemBioSys Genetics Inc. Simple plant proteins are the basis of some of the world's most widely used pharmaceutical, personal care and food products. However, isolating and purifying these proteins can be anything but simple. The time, equipment and expertise that must be committed to this work can add significantly to the cost paid by consumers for the finished product. 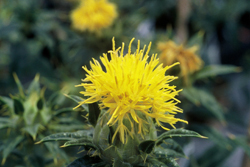 Calgary-based SemBioSys Genetics Inc. is enlisting the help of the safflower plant to reduce this overhead. Specifically, it is using the safflower plant to develop efficient and low cost production of a high-value pharmaceutical protein—insulin. SemBioSys has demonstrated in animals that insulin from their model plant is chemically authentic and bioequivalent to human insulin. Insulin is used to help people with diabetes control the disease. The demand for insulin is expected to increase as the world's population ages and more people are diagnosed with diabetes. Since the current methods of insulin production require vast investments in capital and equipment, there is a compelling need for more efficient production methodologies and SemBioSys is ready to meet this demand. SemBioSys uses a technique dubbed "molecular" or "bio" farming. It involves cultivating genetically modified versions of the safflower that can concentrate different types of proteins in the oil of their seeds. With this technology, obtaining a commercially viable quality and quantity of specified proteins should be as straightforward as processing the oil—a far cry from the elaborate and expensive chemical engineering that might otherwise be required. Today, thanks to Technology Partnerships Canada (TPC), SemBioSys has achieved commercial levels of insulin production. SemBioSys believes that safflower-produced insulin will dramatically reduce capital and product costs through a system that can be easily scaled as demand increases. 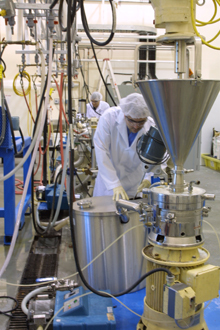 The company's innovative approach, called the Stratosome™ Biologics System, received a major boost in 2001 when TPC made a strategic investment of $5.5 million. This support leveraged an additional $13 million in outside investments. Insulin is not the only product that TPC helped SemBioSys produce commercially. From this success the company began using the Stratosome™ Biologics System to produce Hydresia™, a non-pharmaceutical, natural oil-in-water emulsion derived from safflower seed oil that can be used in moisturizing creams, sunscreens, ointments, lotions, and eye-care products, among others. This technology is also in place in the development of Apo AI, a product intended for use in cardiovascular therapies to reduce plaque associated with stroke and acute coronary syndrome (heart attacks and angina). In addition, the company is engineering safflower plants to produce Gamma Linolenic Acid (GLA), an essential fatty acid that humans are unable to manufacture themselves. The pharmaceutical industry has taken notice of SemBioSys's progress. In May 2005, it received the Company of the Year award from BIOTECanada, a national association representing a broad spectrum of biotech and industrial sectors, academics, and other organizations dedicated to the development of biotechnology practices and products. In part thanks to TPC, SemBioSys currently has one of the most technically advanced R&D facilities for plant-made pharmaceuticals in the world. With the confirmed regulatory path to commercialization in place, SemBioSys projects that its safflower-produced insulin could reach the market in 2012. Safflower is one of the world's oldest crops, though it has never been raised in large quantities. Traditionally harvested for the red dye that can be made from its flowers, more recently the oil from its seeds has become an internationally traded commodity. For SemBioSys, applying this crop to protein production has some additional advantages. The plants need only a small acreage to flourish. They already grow in the northern and southern hemisphere, so crops can be collected year-round. Best of all, safflower has no weedy relatives in the western hemisphere, so there is little chance that genetically modified plants will interact significantly with others. Visit the company's website at: Sembiosys.